16/5/14 - Acquisition - New York, Metropolitan Museum of Art - This fundamental painting, still lacking seriously at the Louvre, has just joined the Metropolitan Museum. However, the Parisian establishment is not to blame in this case since it was never given the opportunity to purchase this work which left our country in the early 18th century and whose last owner, a British citizen, did not wish it to be acquired by France ! We cannot say the same for the National Gallery in London which should have done everything in its power to keep it in England where it resided since the 18th century. Though awarded an export ban for three months, it never succeded in finding a buyer in the UK and finally arrived in the United States. 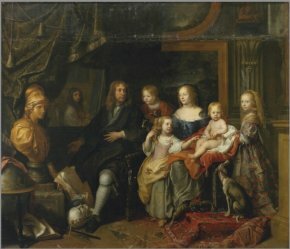 The canvas, a portrait of Jabach and his family, is exceptional for its quality and the identity of the model, the famous collector who turned over most of his works to Louis XIV ; these now reside of course at the Louvre. 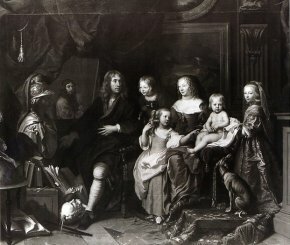 We see Everhard Jabach, his wife and their four children in an interior reflecting the tastes of the master of the house : he is surrounded by paintings, a sculpted bust, books, including a bible and Serlio’s treatise on architecture, spread on the floor next to another antique bust with a compass leaning on it, a pencil case and some sheets, a celestial globe... This is both a family portrait, an allegory of the arts (architecture, painting, sculpture, drawing...) and a superb still-life. A striking aspect of the painting is its Northern European aspect, recalling Dutch group portraits. An almost identical second version, formerly at the Berlin Museum, disappeared during the war and is known today only thanks to a black and white photograph (ill. 2). Until recently, the Metropolitan Museum did not own any works by Le Brun. Last year, it acquired a large history painting in Paris, The Sacrifice of Polyxena, (see news item of 19/4/13). The artist will now be represented by two canvases, of which, one is an absolute masterpiece.